If animals have always been your passion and you envision yourself caring for them on a daily basis, our Veterinary Technician training and degree program can start you down the path to a gratifying and fulfilling career. We offer an exciting vet tech training program in addition to state-of-the-art equipment and facilities. Our students obtain extensive hands-on training and benefit from comprehensive field experience. Our program is home to several “mascots” for the veterinary technician degree program. Together with other patients they provide the authentic experience needed to handle and treat live animals. Our program instills the self confidence needed to execute the tasks expected from a veterinary technician and activates the motivation needed to prosper in this field. 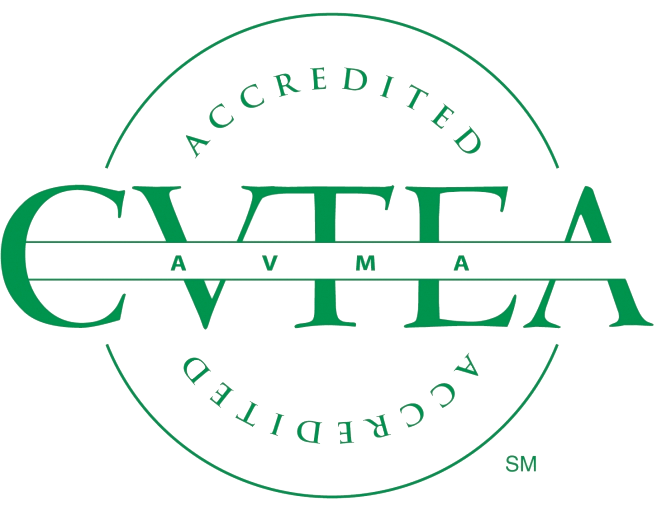 A veterinary technician possesses the skills necessary to assist a veterinarian in various animal care facilities including a veterinarian’s office or research facility. A graduate can assist with examinations, treatment, surgery and laboratory testing for both large and small animals in addition to performing administrative functions as needed. According to the Bureau of Labor Statistics, employment of veterinary technologists and technicians is expected to grow 52 percent from 2010 to 2020, much faster than the average for all occupations. Job opportunities are expected to be excellent, particularly in rural areas. What Is a Veterinary Tech? A vet tech deals with the technical tasks so that the veterinarian is free to do his or her job, including making diagnoses, performing surgeries, and prescribing medications. The work and skills of a vet tech are incredibly varied, from helping to calm and comfort injured animals in an emergency (along with their worried humans) to performing routine laboratory tests. Without veterinary technicians, veterinarians simply couldn’t get done everything that is demanded of them. Vet techs are to animals what nurses are to people. They interact with the animals in their care and develop relationships of trust with them. A vet tech career is the perfect choice for those who love animals and want to help them live optimal lives. Whether you take care of pets in a veterinary clinic or hospital, travel to locations in rural settings to assist with larger farm animals, or work at a zoo or aquarium, you’ll never have the same day twice! If animals have always been your passion and you envision yourself caring for them on a daily basis, our veterinary technician training can start you down the path to a gratifying and fulfilling career. We offer an exciting vet-tech training program in addition to state-of-the-art equipment and facilities. Midwest Institute’s veterinary technician AOS degree program has several “mascots.” Together with other patients, they provide the opportunity for the authentic experience needed to handle and treat live animals. We instill the self-confidence needed to execute the tasks expected from a veterinary technician and activate the motivation needed to prosper in this field. Students are taught the necessary skills to assist with examinations, treatment, surgery, and laboratory testing for both large and small animals, in addition to performing administrative functions as needed. If this sounds like the career for you, consider getting your degree from Midwest Institute. Our program for vet techs is offered at the Fenton campus only. All students are prepared to pass the Veterinary Technician National Exam (VTNE) to work in the field. Our VTNE Results for the July 1, 2015 – June 30, 2018 reporting period are available here. View the disclosures and the Midwest Institute Virtual Library for more information on the veterinary technician program. If you have any specific questions, just contact us, and one of our knowledgeable admissions counselors will respond promptly to assist you. See our Veterinary Technician students in action! Midwest Institute seeks students who have a sincere interest in the veterinary assisting field. Your interest, motivation and commitment are a few of the factors measured when considering your acceptance to the program. For full admissions criteria, information on transfer credits, and how to apply, please visit our Admissions Policy page. Financial Aid is available for those who qualify. To find out more about financial aid and how to qualify, visit the Federal Student Aid website. Financial Aid information is also available by filling out our online form, or by calling 314-344-4440.